Starting one's online gambling career, players, logically, do their best to find the most trustworthy and convenient internet casinos, so that the gaming process isn't only profitable, but entertaining as well. Although being accepted by the vast majority of gambling sites, especially if one owns VISA, or MasterCard, credit cards are the less convenient and even safe payment option among the others. First of all, there might appear problems, connected with inability to make a deposit; secondly, using one's personal credit card is rather risky, as not having made detailed research, the player can never be sure if he/she's gambling in one of the safe online casinos, or not. 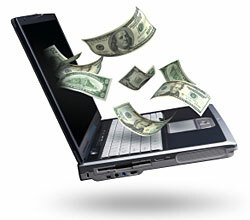 Wire Transfer has gained popularity much due to its simplicity and relatively small amount of time required to make a deposit, in addition to its being quite safe. Nevertheless, the procedure of transferring money from the player's bank account directly to his/her casino account generally takes extra-costs, which isn't very admirable by some players. E-check System online payment method is much faster, than wire transfer, remaining unbelievably simple, as it lies in filling in online checks and sending them directly to the online casino. There have been implemented different modifications of e-wallets, which are all, at the same time, easy in usage, and presuppose the creation of the player's online casino account, which he/she can deposit money to. The main advantages of this online payment method are the possibility to avoid dealing with the player's credit company, and one's ability to control the amount of money he/she is spending. Therefore, e-wallets are generally considered to be incredibly useful, as far as one's willing to manage his/her bankroll in a right way. In a whole, it's definitely one's own choice, which online payment method to use. On the other hand, it's always good to have versatile options, so the most reputable online casinos tend to diversify their payment options.